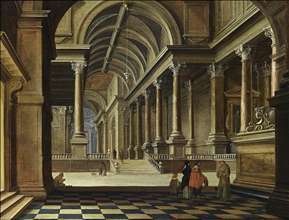 Van Bassen was an architect to the courts of Orange and Bohemia, he had a reputation as one of the most important architectural painter of the first half of the seventeenth century. Nothing is known about his training. The first known document related to him is his registration with the Guild of St Luke in Delft in 1613. By 1624 he was a member of the guild at The Hague, of which he became dean in 1627 and headman twice, in 1636 and 1640. He married Aaltgen Pietersdr van Gilst at The Hague in 1624. 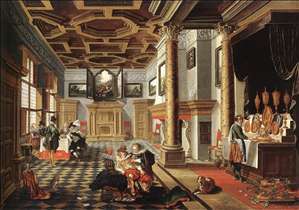 From 1629 until 1634 he was occupied with commissions from the stadholder Frederick Hendrick for the Honselaarsdijk and Ter Nieuburch palaces near The Hague. In 1630-31 he worked as the principal architect on the rebuilding of the monastery of St Agnes in Rhenen as a residence for Frederick V, Elector Palatine and king of Bohemia, and his wife, Elizabeth Stuart. Van Bassen was also involved in a number of architectural projects at The Hague and elsewhere. 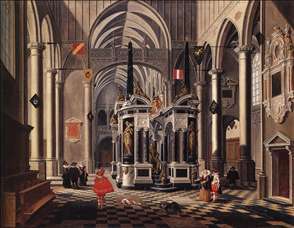 Van Bassen died shortly after his wife and was buried in the Jacobskerk at The Hague in 1652. His son in 1651 married Adriana, the daughter of the painter Cornelis van Poelenburgh. Only the architectural painter Gerard Houckgeest can be identified with some degree of certainty as Van Bassen s pupil. 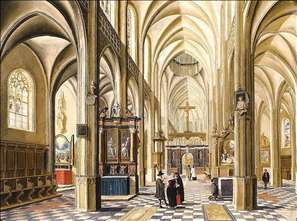 See more details about "Interior of a Gothic Cathedral"
See more details about "The Tomb of William the Silent in an Imaginary Church"
See more details about "Renaissance Interior with Banqueters"
See more details about "Interior of an Imaginary Church"